University lecturer, Adam (Jake Gyllenhaal), is frustrated by the monotony of his life and unhappy in his relationship with girlfriend, Mary (Mélanie Laurent). One night, while watching a film, Adam spots an actor who looks just like him. Consumed by a desire to meet his double, Adam tracks him down - unwittingly starting a dark and dangerous psychological battle. The end of Enemy left me stunned. What had just happened? What was it all about? What on earth did the final, shocking scene signify? All I knew for certain was that I had watched a brilliantly suspenseful and utterly mesmerising film from an intelligent and thought provoking director (Denis Villenueve) with not one but two superb performances from Jake Gyllenhaal. And now I needed to put the pieces of this dark and complex puzzle together. Precious few filmmakers working today credit their audience with even a modicum of intelligence. Too many directors feel the need to spell out every detail of their vision or plot, before tying up their stories in neat little bows. I love films that challenge me, that make me pay attention and that leave me thinking. I love films that inspire conversation and debate. And this is why I love the cinematic conundrums of director, Denis Villenueve (Arrival, Sicario, Prisoners). Enemy is one of only a few films that made me want to watch it again as soon as the credits had rolled. Instead, I worked through the events I had just witnessed until everything finally slotted into place. I then hopped onto Google to see if I was (at least) in the right ball park. There are, in fact, many interpretations of this film. I was strangely comforted to find that mine was among them. However, would it have mattered if it wasn't? This is a film that could easily mean different things to different people - you often take away what you bring in, after all. The very fact that I was willing to do the work and piece together the puzzle that is Enemy is testament to the world that Villenueve created and the performance he inspired from Gyllenhaal. Enemy is a film that will stay with me for a long, long time and a movie experience I would highly recommend. 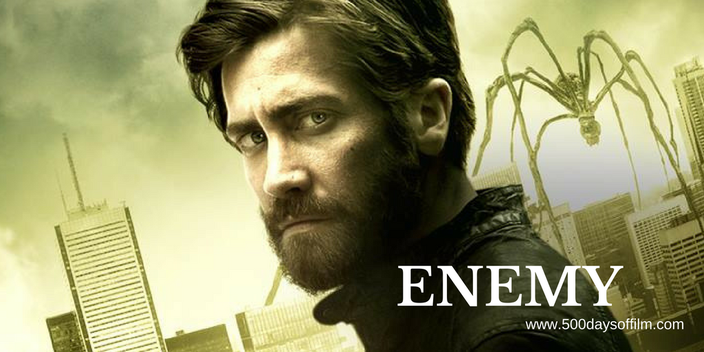 Enemy is based on the novel ‘The Double’ by Nobel laureate José Saramago. Denis Villenueve is fast becoming one of my favourite directors. I have been utterly gripped by all of his films including Prisoners, Sicario and Arrival. If you have, what did you think of this film? Let me know in the box below! I, like yourself, found this film highly intriguing. Great performances from Jake Gyllenhaal and truly a strange situation that begs to be dug deeper into. I read quite a lot of different theories as to what is happening and for the most part they all made sense and you can see where they came from. It does stay with you though, especially that last scene! I love a film that can be interpreted in different ways don't you? I'm glad that you enjoyed it and found it intriguing. I agree about that last scene. Brrrr! !